For decades residents of the Northwest Territories had voiced their concerns over having little or no control over how the territory was run. From 1905 to 1967 the seat of government for the Northwest Territories was located in Ottawa and consisted of a federally appointed Commissioner and his staff. Northerners were rarely consulted before new laws and regulations were enacted. The Northwest Territories Council – created April 20, 1921 – advised the Commissioner on how he should run the north. The four members of the Council were federal civil servants from Ottawa and all were appointed. It wasn’t until 1947 that a member was appointed from the north. In 1951 the first Council members were elected. It wasn’t until 1966 that elected members outnumber appointed members. In 1961, Knut Lang, one of the elected members of the Territorial Council, raised the question of division for the Northwest Territories. The territory, almost a third of Canada, had a population of mostly Inuit in the east and a mix of Dene, Inuvialuit, Métis and non-Aboriginal in the west. Federal Government bills, dividing the Northwest Territories along ethnic lines – with the 105th Meridian as the border – were brought before the House of Commons in 1962. Had they not died on the Order Paper, these bills would have created the new territories of Mackenzie in the west and Nunassiaq in the east. In the early 1960s, division of the Northwest Territories was strongly opposed by many people living in the north. They figured that two new territories, still governed from the south, was a situation that failed to move the north toward more responsible governance. In 1965 the Territorial Council passed a motion calling on the federal government to review the north’s political situation. As a result, the Advisory Commission on the Development of Government in the Northwest Territories was created. This commission – with Alfred Carrothers, Dean of the Faculty of Law at the University of Western Ontario as chairman – became known as the Carrothers’ Commission. Members of the commission were Jean Beetz, a Montreal-based judge and John Parker, the Mayor of Yellowknife ( map). In later years Parker became the Commissioner of the Northwest Territories. 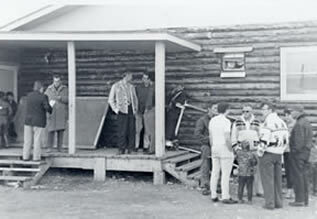 During the summer of 1965 and the spring of 1966 Carrothers’ Commission held public meetings in 51 communities in the Northwest Territories. They asked residents their opinions on what a future Government of the Northwest Territories should look like, whether or not division was a good idea and which community should be made capital. It was clear from the results of the Commission’s public meetings that most northerners wanted powers transferred from Ottawa to the north; wanted a greater degree of self-governance; wanted more control over natural resources; and, didn’t want the Northwest Territories divided. There were no surprises in these results except the one concerning division. Many northerners, particularly in the east, were vehemently opposed to division of the Northwest Territories at that time. Public opinion on the issue of which community should become the new capital was, as expected, split. The recommendation of the Commission was eagerly awaited. Fort Smith was where most northern-based government positions were located and many northerners assumed it would be become the capital. Communities also in the running for capital were Yellowknife, Hay River, Pine Point, Fort Simpson, Iqaluit and Rankin Inlet. The Commission’s recommendations concerning the transfer of responsibility for education, small business, public works, social assistance and local government were accepted by the Federal Government. The Government also accepted the recommendation that Yellowknife become the capital. On January 18, 1967 this decision was made public amid a flurry of controversy. The reasons given were that Yellowknife was closest to the demographic centre of the territories and accessible to the greatest number of residents; telephones services, telegraph, radio and airport. It also had better building conditions and educational institutions. On September 18, 1967 the Government of the Northwest Territories officially came north when Commissioner Stuart Hodgson, and eighty-one employees of the Government of the Northwest Territories, arrived in Yellowknife onboard a chartered DC-7.